For a sweet infusion of rich and creamy flavors, look no further than the Caf� Napoleon flavored coffee. 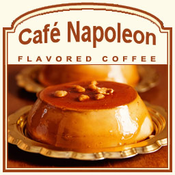 Made with 100% Arabica beans, this Caf� Napoleon features flavors of the thick, chocolate-like Mexican liqueur, sweet French caramel, and brown butter sweetness. With a strong flavor that is full-bodied and irresistible, your taste buds will love the strength of this creamy mix � especially with its lingering finish. Packaged in a heat-sealed valve bag, your Caf� Napoleon will be roasted and shipped on the same day. With only 2 calories in each cup, this rich Caf� Napoleon will give your taste buds the creaminess it desires with a bold taste of brown butter and caramel, without any added guilt. Enjoy!